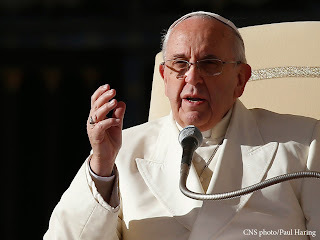 We will begin daily dissemination of the Holy Father's inspiring reflection on the call to holiness in the modern world, one-paragraph-per-day, Tuesday, May 1st. If you have received this post in your email, then you are already subscribed and the document will begin arriving automatically on 5-1-18. Two Weeks until the Launch of "Rejoice and Be Glad"! Are you looking forward to reading the Holy Father's new document on the call to holiness in the modern world? We will begin posting one-paragraph-per-day on Tuesday, May 1st. If you have received this post in your email, then you are already subscribed and the document will begin arriving automatically on 5-1-18. Ready to “Rejoice and Be Glad”? Are you interested in reflecting on Pope Francis’ new apostolic exhortation entitled “Rejoice and Be Glad,” Gaudete et Exsultate? Starting May 1st, join hundreds of others in reading one-paragraph-per-day as we ponder the Pontiff’s thoughts on the universal call to holiness and to mission. If you have already subscribed to www.AJoyWhichIsShared.org, there is no need to re-subscribe. But please consider sharing this link with friends or family members who might be interested in signing up: click here to “Subscribe by Email” (new subscribers will receive a confirmation code to complete the enrollment process).